"What would be your top timeless recipes from Gourmet?" asked Tanya Steel, editor-in-chief of Gourmet Live and Epicurious.com. My first reaction was a momentary brain freeze at the enormity of the challenge-I spent more than 30 years at the magazine, and its archives date back seven decades. Then my mind jumped to the French classics: Visions of Escoffier and Brillat-Savarin wagged their whisks at me as images of standards like boeuf bourguignon, coq au vin, and mousse au chocolat flipped like flash cards through my head. After all, we can't even talk food in this country without speaking Franglais, with words like cuisine, sauté, braise, roux, and chef rolling off our tongues as easily as bacon and eggs. Yet timeless is not the same as classic. Think enduring, or ageless, instead. And while there's no doubt French cuisine will endure, so will many other cuisines. Meanwhile, we Americans, like people of so many other melting-pot nations, have embraced new ingredients and flavors as they've come ashore. We've also traveled the globe and brought back some worldly tastes, and we've adopted and adapted all those influences into our own creations fit to stand the test of time. 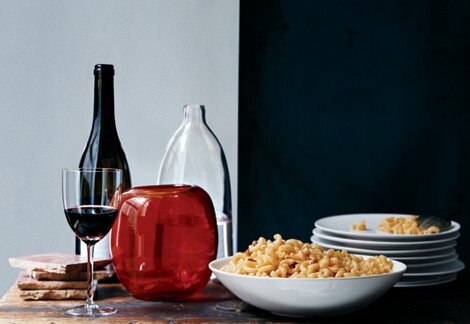 Consider this the ultimate mac and cheese: Buttery, Parmesan-flecked bread crumbs create a blanket of crisp contrast to the perfect union of pasta and a creamy, Cheddar-stoked sauce. Make it stripped-down simple or with mix-ins-it doesn't get better than this! - Preheat oven to 400°F with rack in middle. - Toast bread crumbs on a rimmed baking sheet until pale golden, about 5 minutes. Cool toasted crumbs; with a fork, toss with cheeses, parsley, and melted butter until butter is evenly incorporated. Leave oven on. MAKE SAUCE: - Melt butter in a medium heavy saucepan over medium-low heat and whisk in flour. Cook roux, whisking, 3 minutes, then whisk in milk. Bring sauce to a boil, whisking constantly, then simmer, whisking occasionally, 3 minutes. - Whisk in cream, mustard, Worcestershire, cheeses, 3/4 teaspoon salt, and 1/2 teaspoon pepper until smooth and remove from heat. Cover surface of sauce with wax paper or parchment. - Cook macaroni in a pasta pot of well-salted boiling water until al dente. Drain in a colander. Transfer to a bowl and stir in sauce. Spread macaroni mixture evenly in baking dish. - Sprinkle topping evenly over macaroni; bake until golden and bubbling, 20 to 25 minutes. Plenty delicious on its own, this dish takes on a whole new personality with the mere addition of an extra ingredient stirred into the filling or topping just before baking. - Meaty Mac Add to filling 4 ounces thinly sliced, chopped high-quality ham, preferably country ham, such as Surryano from SurryFarms.com. - Mexican Mac Add to filling 2 to 3 tablespoons minced chipotles in adobo, including some sauce. - Smoky Mac Cook 1/4 pound chopped bacon slices until crisp. Mix into bread-crumb topping. - Veggie Mac Add to filling 2 cups small broccoli florets, cooked crisp-tender, or a 10-ounce package of frozen baby peas, thawed. How many recipes do you need for roast chicken? Only one. This one. Trust us when we say it's the best and easiest roast chicken we've ever had. If you let the bird rest in the fridge with it's rubbed-on salt for the full 48 hours, you will be rewarded with the juiciest meat and the crispiest skin. INSTRUCTIONS - Rinse chicken and thoroughly pat dry, then sprinkle inside and out with salt and pepper and set in a shallow dish. Cover loosely with plastic wrap and chill at least 12 and up to 48 hours. - Put oven rack in middle position and preheat oven to 500°F. - Pat chicken dry, then rub skin with butter and put lemon slices in cavity. Put chicken in a small roasting pan in oven and reduce oven temperature to 425°F. 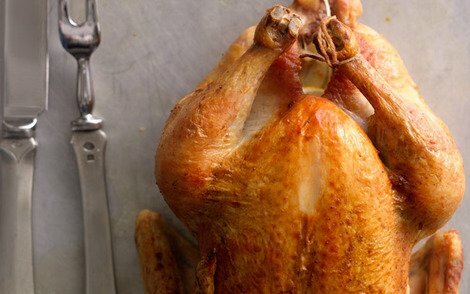 Roast chicken, basting occasionally with pan juices, until thermometer inserted 2 inches into fleshy part of thigh (do not touch bone) registers 170°F, about 50 minutes. Let stand 15 minutes before carving. Having earned the top rating and nearly 1,500 comments, this is the most-reviewed recipe on Epicurious.com. 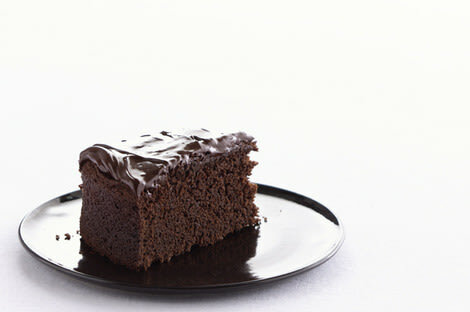 Originally from Gourmet, this cake is super-moist-thanks to the magic of oil, not butter-with a dense, fudgy frosting. You'll get raves whenever you make it, which could turn out to be often. - Preheat oven to 300°F. and grease pans. Line bottoms with rounds of wax paper and grease paper. - Finely chop chocolate and in a bowl combine with hot coffee. Let mixture stand, stirring occasionally, until chocolate is melted and mixture is smooth. - Into a large bowl sift together sugar, flour, cocoa powder, baking soda, baking powder, and salt. In another large bowl with an electric mixer beat eggs until thickened slightly and lemon colored (about 3 minutes with a standing mixer or 5 minutes with a hand-held mixer). Slowly add oil, buttermilk, vanilla, and melted chocolate mixture to eggs, beating until combined well. Add sugar mixture and beat on medium speed until just combined well. Divide batter between pans and bake in middle of oven until a tester inserted in center comes out clean, 1 hour to 1 hour and 10 minutes. - Cool layers completely in pans on racks. Run a thin knife around edges of pans and invert layers onto racks. Carefully remove wax paper and cool layers completely. Cake layers may be made 1 day ahead and kept, wrapped well in plastic wrap, at room temperature. - Finely chop chocolate. In a 1 1/2- to 2-quart saucepan bring cream, sugar, and corn syrup to a boil over moderately low heat, whisking until sugar is dissolved. Remove pan from heat and add chocolate, whisking until chocolate is melted. Cut butter into pieces and add to frosting, whisking until smooth. - Transfer frosting to a bowl and cool, stirring occasionally, until spreadable (depending on chocolate used, it may be necessary to chill frosting to spreadable consistency). -Spread frosting between cake layers and over top and sides. Cake keeps, covered and chilled, 3 days. Bring cake to room temperature before serving.